Young adults can be hyperactive like children and much more vigorous compared to older grown-ups. They are also engaged to different habits that could possibly risk the well-being of their mouth and teeth. Dental problems may occur anytime and excuses no one, not even the lively and high-spirited young adults. Making preventive dental care even more important for them. Bulimia and anorexia are common eating disorders that some young adults do experience. Aside from health complications it can bring to a person, these disorders can damage the teeth’s appearance by eroding the enamel. Though the dentist isn’t responsible for treating eating disorders, they can restore the affected teeth through composite fillings, dental crowns, and many other tooth restorations. The rate of young adults consuming sodas nowadays has almost doubled from where it was many years ago. Carbonated drinks such as soda usually have an excessive amount of sugar and acidic additives that destroy the tooth enamel, leading to tooth decay. Limiting soda intake can maintain your teeth for a lifetime, giving you that beautiful and healthy smile. Young adults today are tempted to try odd, unsafe things. Piercings in the lip, cheek, or tongue introduces significant hazards. Oral piercings can lead to chipped teeth while eating, chewing, talking, and sleeping. Tongue piercings can result to tooth fractures that may require crowns, fillings, and root canal treatments; painful infections; swelling that might restrict breathing; blood clots and blood poisoning. Bad breath and teeth discolouration are the major effects of smoking, aside from gum disease and oral cancer. Smoking is just one of the bad habits that young adults havelearned. Be honest with your dentist if you use tobacco products and deliberate any issues you may be facing with your teeth, gums, and mouth. Young adults are known to be carefree and joyous that sometimes they tend to disregard the condition of their dental health. Consult your trusted Brisbane dentist today to get adequate advices regarding preventive care for young adults. 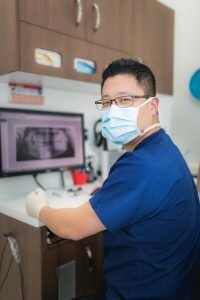 At Precision Dental, we help you attain remarkable oral hygiene so you’ll enjoy having a healthy mouth and beautiful teeth with the help of our comprehensive and state-of-the-art dental treatments.